Israeli Professor Neve Gordon and Palestinian Lawmaker Mustafa Barghouthi on the Israeli Elections | Democracy Now! independent Palestinian lawmaker and democracy activist. a professor of politics and government at Ben-Gurion University and the author of Israel’s Occupation. AMY GOODMAN: The leaders of Israel’s two main parties have both claimed victory in an early general election. With 99 percent of the votes counted Wednesday morning, Tzipi Livni’s centrist Kadima Party was in first place with twenty-eight seats, while Benjamin Netanyahu’s right-wing Likud Party was a close second with twenty-seven seats. Both need coalition partners to gather the sixty-one seats needed to form a government in the 120-seat Israeli Knesset. This puts the ultra-nationalist Yisrael Beiteinu party led by Avigdor Lieberman in a key position, after finishing third with fifteen seats. Meanwhile, the Labor Party, led by Defense Minister Ehud Barak, finished in an unprecedented fourth place. The election has been dominated by security issues, following Israel’s three-week assault on the Gaza Strip. Final results will come within days, when election officials finish counting soldiers’ votes and other absentee ballots. Early Wednesday, Tzipi Livni appealed to BB Netanyahu to join a national unity government that she would lead. TZIPI LIVNI: [translated] In this evening, I’m turning to Benjamin Netanyahu. Before the election date was scheduled, I offered you to join a unity government under my leadership to handle the same challenges that are facing the state of Israel. You refused then. You refused and said that the people will decide, that the people should determine. The people have decided today: Kadima. AMY GOODMAN: The Israeli newspaper Haaretz reports Netanyahu has a better chance of forging a coalition because of gains by right-wing parties, who are his natural allies. Netanyahu claimed victory Wednesday morning, saying a Likud-led coalition would lead Israel. BENJAMIN NETANYAHU: [translated] I will turn firstly to our natural partners in the nationalist camp to form a coalition government, as I promised. I’ve spoken with the parties’ heads already this evening, and we scheduled to begin discussions tomorrow morning about founding a new government in the state of Israel. AMY GOODMAN: Once the final results are in, President Shimon Peres will consult with party leaders to determine who among them stands the best chance of forming a coalition government. He does not have to choose the leader of the largest party. The chosen party leader then has up to forty-two days to form a coalition. If the attempt fails, Peres can ask another leader to assume the task. Elections were called early, after Livni failed to form a new government following Prime Minister Ehud Olmert’s decision to step down last year amidst a corruption probe against him. Olmert will stay on as caretaker prime minister until a new government is formed. For analysis on the election results, we’re joined by two guests. Dr. Mustafa Barghouthi is an independent Palestinian lawmaker and democracy activist. He happens to be in the United States now. He is joining us from Washington, D.C. We’re also joined on the telephone from Beersheba, Israel, Neve Gordon, professor of politics and government at Ben-Gurion University and the author of Israel’s Occupation. We welcome you both to Democracy Now! Let us start in Israel first. Professor Gordon, what is your response to what is happening right now? NEVE GORDON: I think the Israeli political system has been for several years in a crisis mode, and we’ve seen that none of the governments in the past, I think, decade or even more, lasted their full term, because there’s a crisis of representation and so forth. And when a country is in a crisis, there can be change in basically two directions. There can be a renewal of politics for a more moral, a more accepting politics. And there can be another way, which is more a xenophobic, neo-fascist tendency, is a turn to the right, a blaming of the other for all your faults. I think what we see in these elections is that the whole political map has turned even further right than it was. We have to remember that Kadima, which basically won the elections by one point, most of its members were Likud members. And so, we have the Likud, and then we have the Likud II, and then we have Yisrael Beiteinu. Together, they form probably close to 80 percent of the electorate. And so, we have an extremely right-wing Knesset now. Some of the parties are with actually neo-fascist tendencies. And I think the implications internally will be detrimental and even devastating. And I think the implications with Israel’s relations with its neighbors, and particularly the Palestinians, are going to be extremely harsh. And the likelihood that the Israeli government will lead any kind of peace initiative or agree to any kind of peace initiative is slim without external pressure. 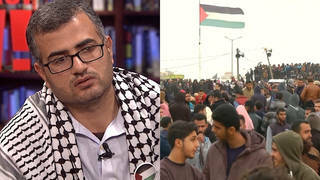 AMY GOODMAN: Dr. Mustafa Barghouthi, your first response? DR. MUSTAFA BARGHOUTHI: I totally agree with what Neve has just said. This is a very serious shift, but not only to the right; this is a shift to racism. In my opinion, in these elections, Israel has completed the transformation into an apartheid state with an apartheid racist political system. And this is the outcome of two processes. One is the implantation of fear and hatred in the Israeli society by the Israeli establishment. The army is a big part of that establishment, and the military-industrial complex is a second big part. And the second factor has been the complicity of the international community. The United States administration, previous administration, the European governments, the whole official international community has been complicit with Israeli crimes, war crimes in Gaza and in other places, and silent about forty-one years of occupation. So, basically, people in Israel think they can do what they want. If they violate human rights in such a terrible manner and nobody is objecting, I think they think they can move forward towards racism and an apartheid system, and that is unfortunately the case today. In addition to what was said about practically the Likud racist approach dominating the whole scene, with Livni and Netanyahu — and here I would agree that there aren’t much differences between the two. Maybe you can say that both of them are racist. Only, Netanyahu is a blunt racist, and Livni is a racist with some makeup. But they both represent the same. And that gives you a very, very simple picture of how tragic the situation is in Israel today. And it puts us all, as Palestinians, in front of a very clear task: we have to struggle against this apartheid system, we have to break this apartheid system. But the challenge now is on the side of the whole international community, which has been either silent or complicit or trying to avoid the issue, when it is very clear. AMY GOODMAN: We’re going to go to break and then come back to this discussion. I want to ask you, Dr. Mustafa Barghouthi, as you sit not far from the Capitol right now in Washington, D.C., if you are meeting with US government officials. And, Neve Gordon, I want to ask you about the rise of Avigdor Lieberman and exact what he represents, for example, calling for loyalty oaths for Israeli Arabs to take if they want to stay in Israel. This is Democracy Now! We’ll be back in a minute. AMY GOODMAN: As we talk about the Israeli elections, this is Avigdor Lieberman, leader of the extreme right-wing party Yisrael Beiteinu, which means “Israel, Our Home,” speaking last week. AVIGDOR LIEBERMAN: [translated] Israel is under combined terror attack from inside and outside the country. Internal terror is more dangerous than the external one, and we should understand that and react accordingly. AMY GOODMAN: This is an excerpt of a commercial from the Yisrael Beiteinu party. YISRAEL BEITEINU AD: [translated] Ahmad Tibi said that Hezbollah captures soldiers because of the Israeli foolishness. His salary is 35,000 shekels. Shame and disgrace. No loyalty, no citizenship. AMY GOODMAN: And this is Hanin Zoubi, the first Palestinian Israeli woman to stand for election. She spoke out against the politics represented by Avigdor Lieberman on Tuesday. Zoubi is running on the Balad ticket, an Arab party in Israel. HANIN ZOUBI: [translated] Indeed, Lieberman is a natural result of the racist policies in this country for sixty years. Lieberman didn’t bring anything new. All the parties demand loyalty from the Arabs. The right, what’s called the center, what’s called by mistake left or center-left, they all demand loyalty from the Arabs. The new thing by Lieberman is only giving the punishment. The punishment for no loyalty is pulling the citizenship. AMY GOODMAN: I want to go now to Neve Gordon, who’s head of the Politics Department at Ben-Gurion University in the Negev. He’s author of the book Israel’s Occupation. In fact, his home was under fire from the Hamas rockets, his kids in a bomb shelter. Professor Gordon, your response to Avigdor Lieberman? His rise, were you surprised by it? And exactly what are the policies he represents? NEVE GORDON: Let me begin by noting that this morning I taught my political theory class, and we were teaching John Stuart Mill’s On Liberty. And what I think John Stuart Mill would say is that Lieberman is more dangerous to Israel than, say, Hamas, because Lieberman can destroy the Israeli political realm more easily than Hamas, because Lieberman does not want to allow any view that is other than his own, any criticism of the government, to enter the Israeli political realm, and that is an anti-democratic and an anti-political message that he’s giving the Israeli citizenship. So I think Lieberman is extremely dangerous. As I mentioned before, I think his party has strong neo-fascist tendencies, and I think that their rise is a manifestation of the direction Israel is going. And I would say it’s an anti-Israeli stance. I do partially agree with the representative from Balad that we cannot understand this as an island, as something totally new, but rather something that has been building up. What we see in — before the elections, that in all the high schools in Israel, Lieberman was the leading party in [inaudible] votes. So we see that the younger generation is supporting these neo-fascist tendencies. And we cannot blame the schools from it, but we have to blame the whole atmosphere in Israel, which is indeed a racist atmosphere, an anti-Arab atmosphere, anti-Palestinian Arab atmosphere. And Lieberman, what he has learned to do well is to feed on the hatred and the fear of the Arabs, to use a xenophobic method. And this is extremely dangerous. And to tell you the truth, I fear for Israel. I fear for the citizenry in Israel. And I think we are in a watershed moment in Israeli politics. AMY GOODMAN: But this issue of loyalty oaths, explain what that is. NEVE GORDON: It’s unclear exactly what it is. And that’s part of its power, is the — it’s whoever is not loyal to the state, according to what Lieberman and his friends believe is loyal, their citizenship can be stripped. What people are saying is that he’s talking about Arabs that are supporting the Palestinian cause for a state and supporting maybe even Hezbollah. They’re not loyal, and therefore their citizenship should be stripped. Now, history teaches us how these things go. You begin by stripping the loyalty of an Arab that supported the Hezbollah, and then you strip the citizenship of an Arab that supported the Palestinian Authority, and then you start stripping the citizens of certain lefty Jews, and that’s how things go. So — and what is interesting about all of this is that Netanyahu, the leader of Likud, said that he supports the motion of stripping citizenship to those who are unloyal to the state. But he said the only — “My only problem with Lieberman’s proposal is that Lieberman doesn’t tell us exactly how to enforce it, and it’s very difficult to enforce.” So, conceptually, ideologically, it’s a much broader political spectrum that’s supporting this connection between loyalty and citizenship, and that is extremely dangerous, I think. AMY GOODMAN: Dr. Mustafa Barghouthi, you heard the interview with former President Jimmy Carter. Do you think a two-state solution is still possible in the aftermath of the assault on Gaza? And what is the extent of the settlements now in the West Bank? DR. MUSTAFA BARGHOUTHI: First of all, let me please comment a little bit about Lieberman. I think when he speaks about loyalty, he’s practically speaking about ethnic cleansing, to repeat some acts of ethnic cleansing that took place in Palestine in 1948. But it’s about getting rid of the Arabs who live in Israel and who have Israeli citizenship and who represent 20 percent of the population. And more than that, when he speaks about loyalty, just to make it clear, it would be anybody who is against war, for instance, that is conducted by Israel, on Gaza or anywhere else, would be considered as an illoyal or unloyal citizen. Anybody who is not supporting occupation would become not loyal to Israel. This is why it’s very dangerous and risky. It is putting the oppressed, which are the Palestinians and the Arabs, who are oppressed from racism and discrimination, in a situation where either they approve of their own oppression by the Israeli government or they become disloyal to the Israeli government and then entitled to losing their citizenship. That is the risk, and that’s why it looks like a very clear neo-fascist approach. Now, on the issue of settlements, I want to say that since 1967 there hasn’t been any period where there was a real freeze of settlement activities. On the contrary, they have been growing at a much faster rate, especially during the times of the so-called peace process. During Annapolis period, the rate at which settlement continued to expand was forty times more than before Annapolis. And now we are witnessing the creation of even new — whole new settlements. That was under Kadima. That was under the coalition of Labor and Kadima, Livni and Barak, and without Netanyahu. So you can imagine what would be the case. In my opinion, we have reached a very critical moment, and that’s why these elections are of great importance, because the bringing in of racist tendency in Israel and this whole extreme coalition into the Israeli government, which would be the case, is happening exactly at a moment when we are about to lose the last opportunity of two-state solution, because of the growth of settlements, because of the fragmentation of the West Bank, because of the consolidation of a situation where Palestinians practically live now in bantustans and ghettos. And they’re in a situation where, after fifteen years of the creation of the Palestinian Authority, the only road open for it by Israel is to become only a security sub-agent for occupation and something like Vichy government in a bantustan entity. That is the risk. And that’s why this is dangerous, not only because it is against peace, but also it is like the last hit in the direction of killing the final or the last opportunity of two-day solution. And this has been a subject that I’ve been discussing here with many people in the United States administration. At the Senate yesterday, I had a very, very good meeting with John Kerry, the head of the Senate Foreign Relations Committee. And I hope. I hope. The only thing that can stop this wave of extremism, this wave against peace, is only a strong United States stance. I don’t know if it will happen. But I can tell you, this is the time of challenge. If the United States does not immediately take steps to stop settlement expansion and if the United States does not immediately take steps to tell Israel enough is enough, I think the two-states option will be lost forever. AMY GOODMAN: Do you feel, Dr. Mustafa Barghouthi, as you come here to Washington — you’ve come here many times —- that you’ve come into a new era, a new government? Do you think President Obama represents something different? And what are your thoughts on George Mitchell as his Middle East envoy? DR. MUSTAFA BARGHOUTHI: Absolutely. It is early to say still, because, you know, many appointments have not been filled yet, but so far, from what I have seen from the people I have met with, you can feel the breeze of change in Washington. You can feel it’s a totally different Washington from what we had, for instance, three months ago or two months ago. AMY GOODMAN: Explain what that — explain what that agreement was. AMY GOODMAN: And George Mitchell? DR. MUSTAFA BARGHOUTHI: About Mitchell, I think that is a positive — I think the appointment of Senator Mitchell was perceived in the Middle East as a very positive step. I consider it very positive. I know Mitchell. We’ve met before. I know that his stand on settlements was very clear. And now is the change. I think after coming to the area one or two — two or three times more, it will be clear whether he — that the only recommendation can — he should make immediately is to stop settlement activities. And if that does not happen, then, unfortunately, I think the whole area would go into a complete collapse of the peace process. I think I feel here in Washington some new trends. First of all, there is more sensitivity to the issue of settlements. I think there is more inclination to accept our view, our point of view, that Palestinians are — should be allowed to have a national unity government, and thirdly, that we should allow Palestinian democracy to be revived. You know that Israel has slaughtered the democratic transformation in Palestine by arresting our members of parliament. And if Israel is entitled to democratic elections, then I think we, as Palestinians, are entitled to that. I believe this is just a beginning. I hope we will go in the right direction. And maybe these results of elections in Israel will show everybody the time has come for a real change in the American policy. Every value that President Obama spoke about — values of respect of human rights, of democracy, of respect for Geneva Convention, avoiding torture, justice, equality, equal opportunity — every value of those are violated by Israel. AMY GOODMAN: We’re going to have to leave it there. Dr. Mustafa Barghouthi, independent Palestinian lawmaker and democracy activist, ran for president of the Palestinian Authority. Neve Gordon teaches politics, head of the Department of Politics and Government at Ben-Gurion University in the Negev. He is author of Israel’s Occupation.